You can tell a lot about a city by the kind of public art it displays. Mexico City and Rome are known for their fountains, lovely lush centerpieces that attract the eye and cool the senses on a hot summer day. London and Paris have major monuments like Trafalgar Square or the Arc de Triumph. Chicago, my city, has a cheerful and even irreverent attitude towards its public objects. Witness the cow sculptures that took the downtown by storm several summers ago. 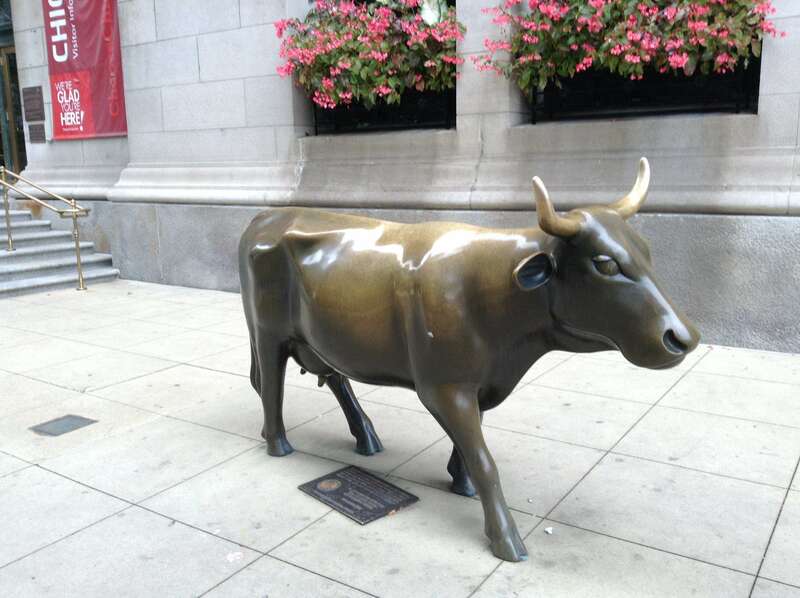 While each huge, life-size cow was the same shape, artists were invited to embellish, paint and decorate the different cows as they saw fit, and the result was a delight for Chicagoans and visitors, alike. These beautiful bovines could be found grazing all over downtown, often with a satirical message emblazoned on their ample flanks. This year, the summer art piece features five-foot heads. Yes, huge, female heads painted different colors adorn the corners of Michigan Avenue and other streets along the Loop and the Magnificent Mile. But that’s not all. Wildly colorful flowers cascade like the abundant locks of an urban goddess from the crowns of every head. It’s as if Ceres went wild and decided to embellish our all too short summer season with a fantastic display, to help us forget the long cold winters that are never far behind. Some people feel that these no doubt expensive temporary additions to the cityscape are frivolous, or given the city’s bleak finances, even wasteful. I disagree. Aesthetics have a huge influence on how we perceive a city, and the more flowers we can shower on our streets, the more foreigners will want to visit, and the more residents will want to stay. These gigantic serene faces with their crowns of geraniums, nasturtiums, and daisies call out our smiles, just like the cows or the face fountains in Millennium Park call out to children to come and play in the water. Without words, this art jokes that huge heads are just what you’d expect from the city of big shoulders (my apologies to Carl Sandburg), so come on down and have an ice cream while you admire the view.